As we approach our departure date for Ghana, hopes, expectations, excitement and anticipations are building up. Searching for balance and meaning in our lives in these times can be challenging. In order to honor the midline we must each remember to focus on those parts of life that are often ignored in a busy day. Help us reach our goals while focusing on YOU! Our 2 day yoga workshop series can be a special treat for you and your friends. $30 allows you to attend the workshop for one full day, $50 for the whole weekend. Attend as many or as few sessions as you would like to. Bethany is a devout student and teacher of Prana Flow Yoga. Her teaching style is inspired by her life’s experience of living near the ocean and studying yoga for the past decade. Bethany offers a liberated, dynamic approach to yoga and intuitively guides her students to surrender to pure consciousness while allowing the ecstatic wave of breath and movement to harmonize within the physical body. Bethany embodies the teachings of flow and brings incredible love, passion, and healing into each sadhana. She gracefully invites her students to treat each asana as a mudra, and to find balance between intense strength and complete surrender while remaining open to the limitless possibilities of Prana. Tim Flood plays music from and for the soul. A versatile multi-instrumentalist with a special love for the guitar, Tim composes and performs original songs influenced by his love for nature, people and Love itself. Tim's music is a soulful journey that uplifts the spirit and inspires the heart. When he's not making music, Tim can be found riding the waves, practicing yoga and loving the Earth. As a young devotee of his Guru, Paramahansa Yogananda he was always interested in joining the kirtan group at the Self-Realization Fellowship temple in Pacific Palisades, CA. He began his study as a teenager with Hari Har Rao, a renowned classical Indian musician, teacher and tabla student of Usted Allah Rakha; Ravi Shankar’s tabla accompanist for many years. Prem Das has played kirtan and concerts in locations around the country such as Los Angeles, San Diego, San Francisco, St Louis, Maui, and Santa Fe. He was also featured on a popular CD by Joni Bishop. Although he was trained in the classical Indian style, Prem Das’s primary focus has been playing kirtan; the traditional Indian devotional chanting practice that is usually in a call and response format. He has been privileged to accompany such great and devotional kirtan leaders such as Swamis Nirvananada and Magdalananda. He has also accompanied musicians singing the more classical style of devotional music called Bhajans. In recent years Prem Das has been excited to be playing with some great fusion and world music musicians. 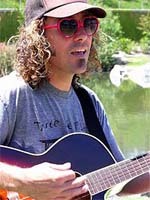 Prem Das is available to play or accompany musicians for yoga classes that are featuring live music. 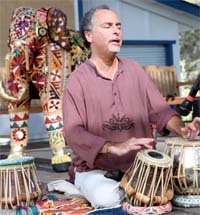 He also offers private beginning tabla lessons at his him studio in Cardiff-By-The-Sea, CA. International Language. She leads a Free Laughter Yoga Club in Chula Vista,Ca., is a Master Reiki and teaches Meditation, Self-Help seminars, Coaching and is a Reconective Healing Practitioner. Karen is also the mother of one of our Gonna Go to Ghana students! 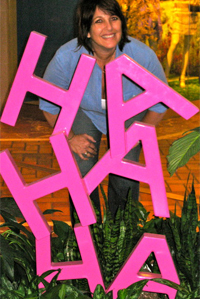 The goal of Laughter Yoga is to bring good health, joy and world peace through Laughter. Laughter is universal with no language and cultural barriers. Laughter Yoga Clubs are fast growing into a worldwide community of like-minded people who believe in unconditional Love, Laughter and Fellowship. Mitch Gerber teaches Falun Dafa, also know as Falun Gong. Mitch believes that everything happens for a reason and we are all searching for unconditional peace and happiness within our hearts. Mitch practices and shares this amazing Chinese meditation and spiritual discipline as a way to connect to the Divine and uplift the soul. Falun Dafa, also known as Falun Gong is a traditional Chinese self-cultivation practice that improves mental and physical wellness through a series of easy to learn exercises, meditation and development of one's Heart/ Mind Nature (Xinxing). The spiritual practice is based on the universal principals of Truthfulness, Compassion and Tolerance. Cultivation" means continuously striving to better harmonize oneself with these universal principles. "Practice" refers to the exercises – five sets of easy-to-learn gentle movements and meditation. Cultivating oneself is essential; practicing the exercises supplements the process. Following the spiritual principles, practitioners of Falun Dafa are able to reach very high spiritual realms, enlightening to the true meanings of life, and finding their original kind selves. Yoga and Fitness Professional, Christian Woelk stresses complete development of the individual through fitness, yoga, healthy nutrition and other holistic mind – body techniques. This focus on the self naturally helps to create a better physical, mental, and spiritual balance. This can also aid in an overall increase in strength, flexibility and clarity, and aid in a decrease of weight and stress levels. This style of yoga and fitness training allow you to access new levels of awareness, balance your emotions and transform "stuck" energy into productive energy. Christian's style is gentle, yet challenging: safe, yet liberating: mindful, yet spontaneous. The hope is that your experience will be a rewarding one; one in which you are inspired and educated at the same time. Kundalini Yoga/Meditation works on the premise that the body has eight "chakras," and through use of "breath of fire" (rapid breathing), one can heat up the body from the bottom up, eventually "raising kundalini" to achieve a feeling of high enlightenment. A practical and powerful tool for self-healing that can be practiced by anyone. Kundalini utilizes postures, movement, stretching and exercise along with breath, sound current and meditation to work all aspects of your being. Kundalini Yoga helps to calm the mind and emotions, balance the glandular system and strengthen the nervous system. The body's energy that is found coiled at the base of the spine; symbolized by a coiled female serpent. 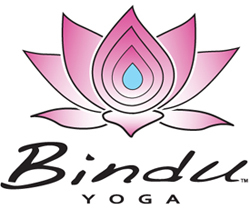 Kundalini yoga uses the breath-- specifically, moving the breath along the spine to stimulate different energy centers. Shakti began her practice of yoga in 1997. She was drawn to its philosophy of oneness and practices of self-discovery. As Shakti’s practice became more serious, her experience and knowledge grew through self-study. In 2007 she formalized her study with the International Sivananda Yoga Vedanta Organization. She received the name “Maha Shakti”, meaning Great Creative Goddess, from Swami Svaroopananda at the Sivananda Yoga Ashram in Nassau, Bahamas. She is a Registered Yoga Teacher with the Yoga Alliance at the 200-hour level. Shakti’s teaching style is derived from her eclectic experience of yoga (including Ashtanga, Vinyasa, Hatha, Anusara, Sivananda, and Kundalini) as well as Buddhist meditation, shamanic journeying, clairvoyant and manifestation energy work and natural healing abilities. She holds space for students to have their own experience and guides them to discover their essence with love. In 2010 Shakti launched Prosperity Hive, a downtown yoga and dance community center. http://www.prosperity-hive.com for more information. In 2011 Shakti began teaching Kundalini Yoga after studying in 3HO (Healthy, Happy, Holy Organization). Her passion for yoga is a life long path. She is excited about sharing yoga and welcomes you to join! Restorative Yoga gives the body, mind and soul an opportunity to rest, relax and restore in gentle, conscious intention. The mind is fused with the breath and tunes to the body. The conscious breath guides the body into movement. The class includes meditation, pranayama and practice of floor-based Asanas. Continually supported by the earth or floor, one can let go of the busy world and be still with their soul essence. This peace transfers off the mat and into one’s life. Yoga came into Mark’s life as an opportunity to fine tune the physical body. Now, Yoga has become a way of life for Mark. 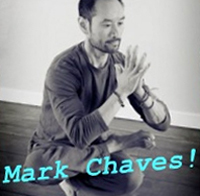 Mark’s passion is to give back by sharing his knowledge as he continues to learn from the ancient practice of Yoga. Meditation is a healing practice that allows us to experience inner calm and deep relaxation. For thousands of years, people have used meditation to move beyond the mind's busy activity and emotional turbulence into profound peace and expanded awareness. In the 21st century, the restful awareness we experience during meditation is more valuable than ever. The pace of life has accelerated, and every day we are bombarded with more information and stimulation than our ancestors encountered during entire lifetimes. The most direct way to experience inner silence and well-being is meditation. When you meditate, your breathing slows, blood pressure decreases, and stress hormone levels fall. Meditation isn't about forcing your mind to be quiet, but about experiencing the quiet that is already there. Even when your mind is filled with agitated thoughts, you still have access to the inner stillness and calm that always lies beneath the choppy surface of thought and emotion. Through this Intro to Meditation class, you will begin to cultivate your home meditation practice. Cara Cadwallader has been working alongside Lamine Thiam, a local Senegalese dancer and drummer, to fuse the heart-pounding rhythms, as well as the foot-stomping choreography, of West African dance with the improvisational flow, as well as fluid grace, of post-modern dance forms. Join us for a sweet hour of sweating out our prayers (for Ghana!) and for shaking out all that we've been holding on to. Cara is the founder and creative director of the Prosperity Hive, "San Diego's Sweet Spot for Whole Being Sustainability" - a green yoga and dance community center located in East Village. She is a dance philosopher who wields a metaphor of movement, along with an MFA, in weaving together a unique and multi-disciplinary approach to art-making and life-living.